If there's one kind of meat that I couldn't get enough of, it's chicken! Whether it's boiled, steamed, braised, fried, grilled or roasted, chicken tastes good. Actually, I've even made a separate category just for chicken alone! And to add to my growing collection of chicken places, I've recently visited Peri-Peri Grill House in Greenhills Promenade. For those of you who don't know, Peri-Peri is a South African spice also known as the African Birds Eye Chili. When African natives introduced this fiery little spice to Portuguese settlers, they experimented with it and later on created a masterpiece otherwise known as the spatchcock (butterflied) Peri-Peri chicken. Luckily, we don't have to fly all the way to South Africa nor to Portugal just to get a taste of this healthy and uniquely-spiced poultry since we already have the Peri-Peri Grill House in the Metro. I know I've been talking about the Peri-Peri chicken, but since it was a hot and humid afternoon when we dined in, I couldn't think about anything else aside from getting myself a nice, cold drink. 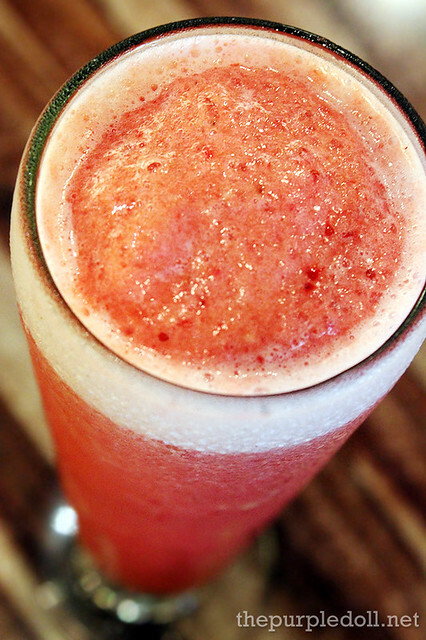 And what better way to quench my thirst than to order first a tall glass of fresh Banana Strawberry Smoothie (P65) which has a stronger blend of banana. 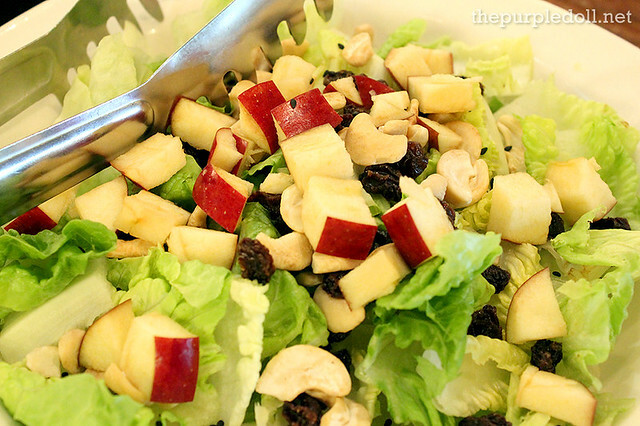 As a meal starter, we got a Garden Salad (Regular P180; Family P340) which is a light salad made up of a mix of lettuce leaves, apple cubes, cashews and poppy seeds dressing. True to its promise, this is indeed very refreshing and light on the palate, as well as for the stomach. A great appetite-whetter for a chicken-loaded afternoon meal. 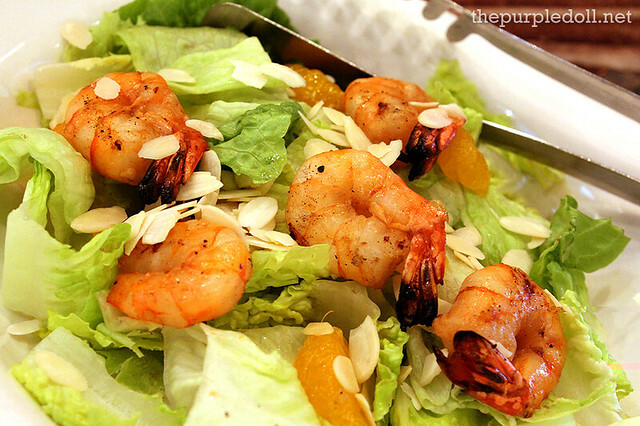 We also ordered the Grilled Shrimp Salad (Regular P225; Family P380), an ensemble of lettuce leaves and grilled shrimps with three-fruits dressing. While the grilled shrimp pieces in this salad gave off a smoky, savory flavor to the whole plate, I found the dressing in this one more refreshing than the Garden Salad's. I also prefer this salad item than the previous one, and I'll totally re-order this the next time I visit the restaurant. 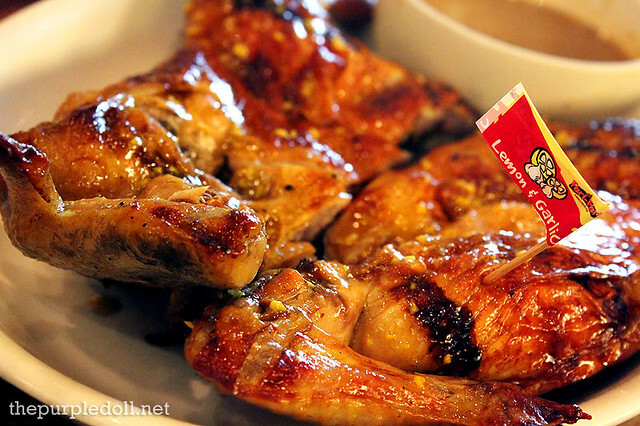 After the salads came the food item we were all been waiting for, the Peri-Peri Chicken (1/4 P140; 1/2 P260; Whole P490). Since we were a big group, we ordered one of each flavor. And for our side of the table, we had the one in Lemon and Garlic. As promised, the chicken was so moist and succulent. Even the breast part was tender and juicy enough for my liking. However, the flavor we got didn't live up to its lemony and garlicky claim. Yes, you can taste a hint of the lemon and the garlic, but it was definitely lacking. The Peri Mild on the other hand, was right up my alley. It was as tender and as succulent as the previous one we've tried, but it was definitely more savory. It also has a distinct herby and spicy flavor that I really love. When I revisit Peri-Peri Grill House, this will definitely be my default order. I mean, just look at that glossy and scrumptious skin! We also got the Peri Hot which I unfortunately, wasn't able to try. 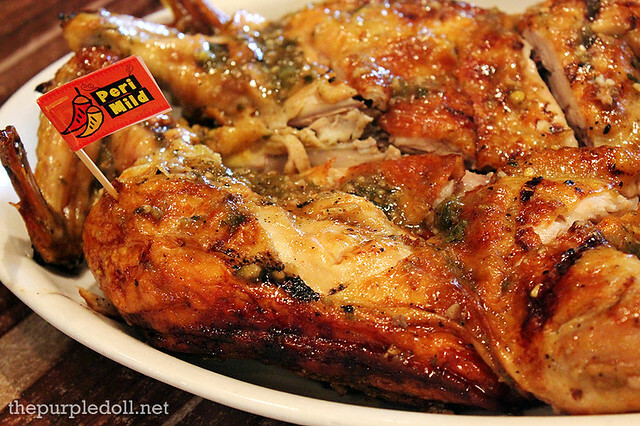 Looking at it though, I think it has the same moist and succulent chicken meat and flavorful grilled skin. And with it's claim of being hot, I'm sure it's really quite spicy 'cause even the Peri Mild can already be moderately spicy for those with low spicy food tolerance. All orders of Peri-Peri Chicken comes with a gravy, by the way. There are also Peri-Peri hot sauces readily available on every table which I loved to bits! They add more flare and more spice to the already great-tasting chicken which you can happily eat even on its own. I would've chosen to eat the chicken without any sidings if only I wasn't hungry. However, since it was my late afternoon lunch, I just had to have some carbs. 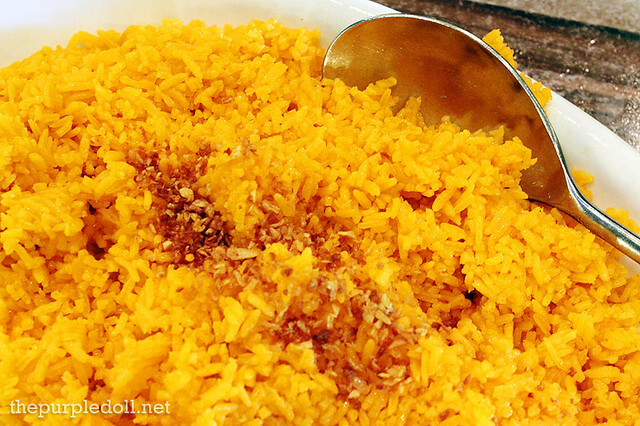 Good thing, all of us on the table wanted rice, so we ordered big servings of their Java Rice. Honestly, I'm not really a big fan of java rice in general 'cause I'm not too crazy about atsuete oil. However, this serving was good as it is and went pretty well with our Peri-Peri Chicken orders. 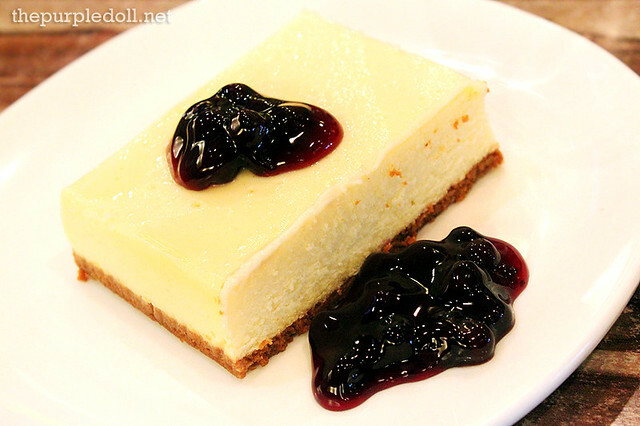 For dessert, I had an order of the Blueberry Cheesecake (P148). 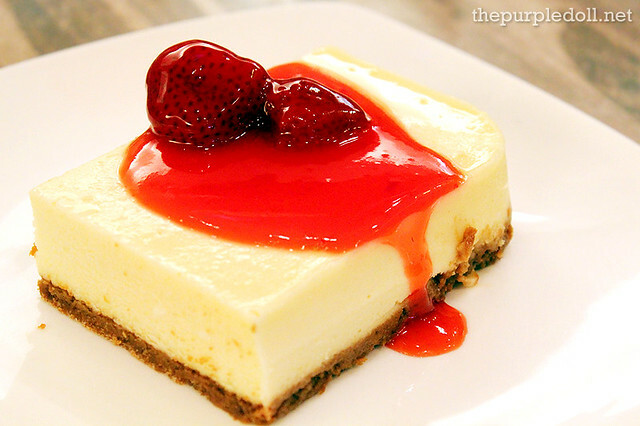 I'm quite picky when it comes to cheesecakes, but this one passed my taste buds. It was creamy with just the right balance of sweet and sour. However, I found the cheesecake quite dense. One of us ordered a Tiramisu (P140), an Italian dessert of coffee-dipped ladyfingers, and liqueur-flavored egg yolks and mascarpone cheese mixture. Generally, I'm not too fond of this sweet treat, and the restaurant's version also didn't help. The liqueur in this serving is quite strong for my liking, and the ladyfingers had a tough, unpleasant texture. 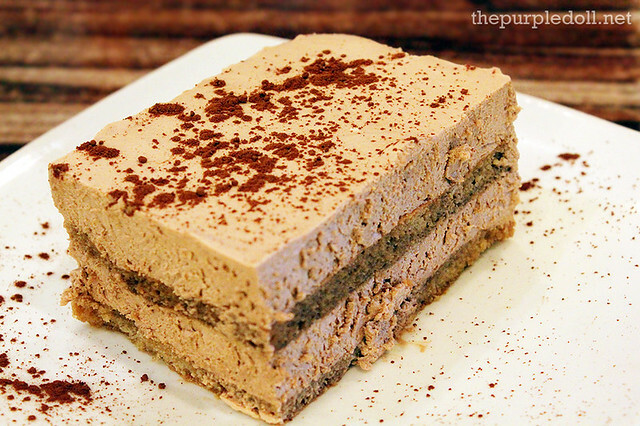 We also got to try the Choco Tiramisu (P140) which is another take on this Italian dessert. This time though, with a hint of chocolate. 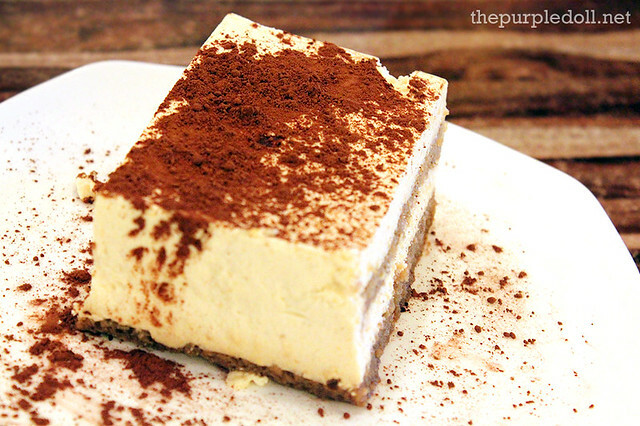 Compared to the previous tiramisu, I like this a lot better because of the friendlier flavor. However, just like their plain tiramisu, the base of ladyfingers was just too tough, too gooey and too crumbly. If only they'd work on the base of this dessert, I'm sure I can give this another try. 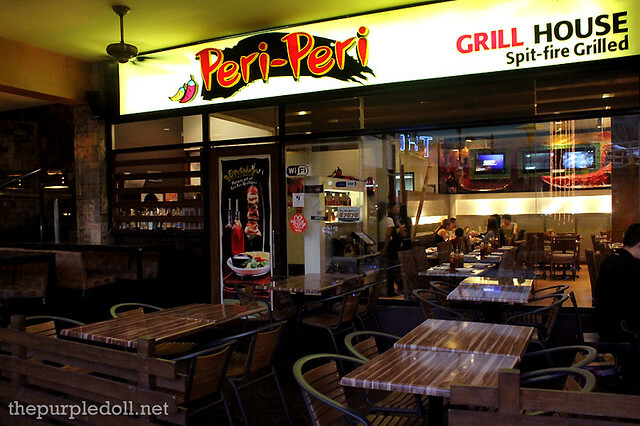 I already got to eat at Peri-Peri Grill House's SM North EDSA branch during my pre-blogging days. And just like my first time, I was again satisfied especially with their tender, moist and savory Peri-Peri chicken for this second visit. So despite some misses on the desserts, I'm very sure to revisit Peri-Peri Grill House again and again. I think this is a local chain if I'm not mistaken. The grilled shrimp salad looks so delicious! By the way Sis, is there a special template on how your posts look that way (photos looks smaller on the right side)? Is it alright if you can refer to the person who has helped you beautify your blog? Thanks! Everything just looks delicious ..Man I just want to taste those delicious mouth watering chicken..
http://www.vijayschawalla.co.uk/ .This is the place on of my personal favorites for Indian menu..especially my personal fav. Punjabi dishes and Gujarati phaphda. It's my first time to hear about this peri-peri grill house and this place is very interesting. The foods are also very delicious and I am craving for all of that. One of this days I will visit this restaurant so that I can taste the foods they offer. Thanks. Thanks to Openrice I once dined here. The food is gorgeous! 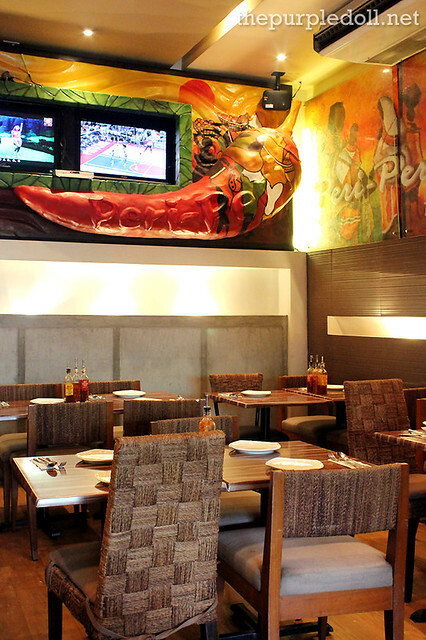 Peri-Peri is one of our favorite restaurant at the Promenade. I love their chicken peri mild. We tried this restaurant at Greenhills. Since we dont want to eat in a fast food common resto, we tried Peri-peri. I cant really forget about the taste of their chicken. Moist, and spicy! Brillaint Article. I'm huge fan of peri - peri chicken. It Is the Best tasting chicken i ever had in my experience. Nando's India provides this peri - peri chicken with excellent flavour, taste & quality. Nando’s chicken provides a well balanced meal that’s lower in fat and high in protein, without compromising on taste. I tried peri peri chicken at church street in India. The chicken is so delicious.